Enhanced Abilities: Thor is an Asgardian god and as such he has vast super human strength, super human speed, agility, endurance and durability. Invulnerability: Thor’s Asgardian flesh is denser than a humans and provides him with virtual invulnerability to physical and energy attacks. Regenerative Healing Factor: Like all Asgardians, Thor, although he is inhumanly durable, at least by human standards, can still be injured, also like all Asgardians, his metabolism enables him to rapidly regenerate damaged tissue much faster and more extensively than a human being. Immortality: Thor is functionally immortal and cannot be killed by conventional means, thanks to the entity “Death” dying in his universe. Flight: Thor has shown the ability to fly. Electrokinesis: Thor usually uses the Mjolnir to channel his storm skills but he is able to discharge the rays from his hands. Likewise, he summoned a ray of heaven without the Mjolnir. Weather Control: Thor as the god of thunder and son of Gaea was born with the natural ability to control weather since birth. Thor normally relies on Mjölnir to control the weather with devastating degree and release blasts of lightning. 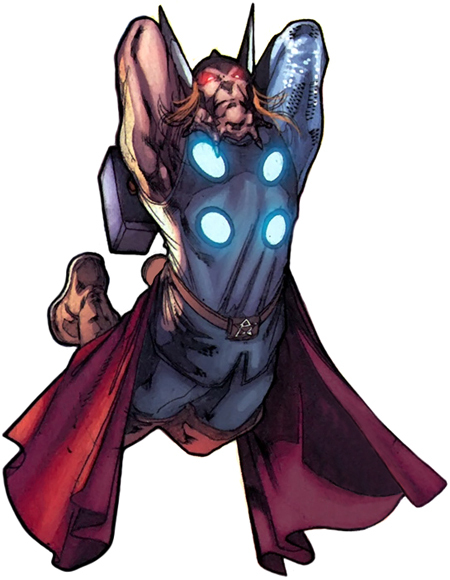 Mjolnir allows him better more precise control over his powers and allows him to better regulate his power output, and can act as a shortcut to access his natural powers. Dimensional Travel: Thor is able to transport himself across dimensions using Mjolnir. Mjolnir: Mjolnir is a symbolic weapon of Thor, a hammer forged from Uru metal, whose chief properties are durability, the ability to maintain enchantment, and absorb energies. Mjolnir resembles more of a short handle mallet than a traditional warhammer. Mjolnir itself is already extremely durable, and combined with the various enchantments placed upon it by Odin, is even harder. It has survived heat as extreme as the heart of the Sun, and blasts powerful enough to destroy planets. After the Cancerverse was corrupted by the Many-Angled Ones and Death was vanquished by Lord Marvel, Thor and his fellow Avengers were corrupted and placed under Mar-Vell's service, now calling themselves The Revengers. They fought against the forces of Earth-616 in an attempt to corrupt that reality as well.